It is our pleasure to announce the nomination and subsequent honor bestowed upon Dr Mamello Thinyane, Head of the Fort Hare Telkom CoE under the category Outstanding Black Researcher at the 2011 DTI Technology Awards. A certificate and trophy was presented by the Honourable Minister Dr Rob Davies at an event witnessed by over 500 guests in Polokwane on Thursday, the 21st of October. The awards ceremony also featured 30 other companies, projects and individuals contending for 10 category awards supported by DTIs technology programmes which include: Support Programme for Industrial Innovation (SPII), Technology and Human Resource for Industry Programme (THRIP), and the Seda Technology Programme (STP). 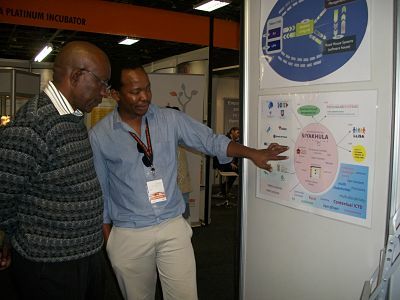 The DTI also organised a two-day exhibition session, under the theme “Bridging Communities Through Innovation” in this Capricorn District Municipality of Limpopo from the 20th to the 21st of October. This allowed the public and over 400 Grade 10 and Grade 11 learners to be exposed to the latest innovations in the field of science and technology. The Fort Hare Telkom Centre of Excellence team had the privilege to be part of the exhibitors, showcasing their flagship multi-disciplinary initiatives, Siyakhula Living Lab and Reed House Systems. More information on the event is available in the article Minister Davies Announces Technology Awards Finalists.